Check out our sister adventures with wild hog hunting by clicking the button above! We are located in Temple, Oklahoma! Skipper is available to speak at schools, churches, events, special appearances, production, and more. Use our contact page! We are booking for 2019. Click on the contact page to send us an email to book. See ya in the water! Season starts June 1st. Season usually ends about the middle of August. Depends on what mother nature throws at us! Come get your noodle on with Big Fish Adventures, and Be the Bait! Use our contact page to get in touch with us. 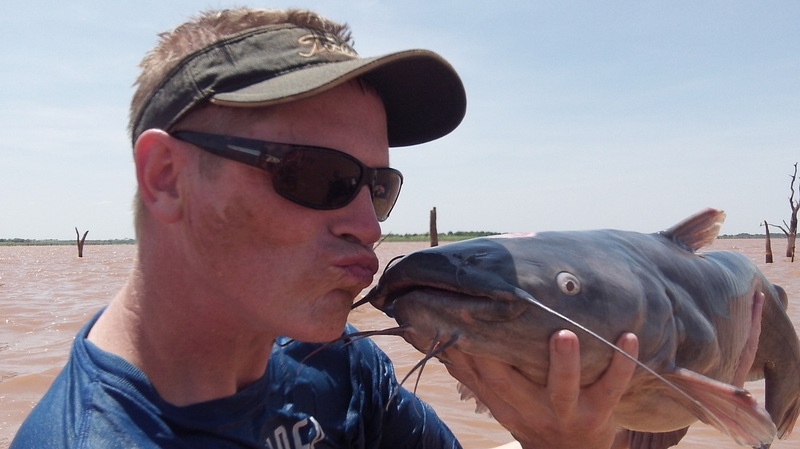 If you want to experience some extreme fishing, try noodling! Noodling is the art of fishing bare handed for flathead catfish that are monstrous. Catching fish in their domain with your bare hands and feet may seem impossible to some, but unto the Bivins family, it has become a family tradition and a passion. We have been noodling for several generations, perfecting techniques that enable us to catch fish that are just swimming or lying on the bottom of rivers and the creeks, or in brush piles. Open water noodling takes much practice and a lot more skill, but catching a fish when it is protecting it's nest of eggs and is intent upon biting any intruder takes a person that wants to conquer their fear of the unknown. How big is the fish? How hard will he bite? When will he bite? This style of fishing is an adrenaline junkies paradise. Skipper caught his first fish when he was four years old, a small one. The largest he ever caught was 111 pounds. Most trips abound with 15 to 50 pounders. A fishing experience to last a lifetime. Whoppers! We do more than tell them!! For a huge adrenaline rush, come go noodling with Skipper Bivins, family, and friends. Whether you want to take pictures, watch, or participate, come and go fishing with us and all of your whoppers will be true!! We have had people come all the way from Thailand to share this experience, so don't miss out! You have to also watch out for the snakes, and that is also where another person comes in handy to be a snake watcher. We also fish the lakes and go to the river. The river is a piece of heaven. At the river, there are very little holes in the banks, so we catch them in open water or in the brush, which takes a lot of skill. Not many people can catch them this way. But it can be done! Skipper is a great teacher! We usually go to the creeks at the beginning of may searching for the big blue cats that spawn early on before the flathead. They are the most fun to catch. Compared to the likes of a shark attack. The fish are actually cleaning out holes in the bank, so that the females can go lay eggs. Then the male fish are the babysitters. They protect the eggs from attackers. So any time that anything goes in front of the hole, they attack. That is how we catch fish by noodling. We actually call it grabbling, but the Oklahoma Wildlife Department calls it noodling in the regulations. A lot of people go head first or hands first, we go feet first, mostly for safety reasons, but leaves your hands free. Most people also wear tennis shoes, which leads to missing a bunch of holes and fish because you just can't tell. You definitely don't want to go alone because it can be dangerous. You also want someone there to string the fish and block holes. It is an awesome adventure. Very family oriented sport. A fun time to be out in nature and be with family and friends. Something that can be passed down from generation to generation.